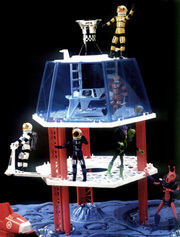 One of my fondest memories of childhood was playing with my collection of Major Matt Mason toys. Matt Mason, Sgt. Storm, Doug Davis and Jeff Long were some of my best friends. Between watching Apollo moonwalks and Star Trek re-runs on TV, it was the space toys, models and -- most importantly -- books that kept me interested in the space program and inspired me to pursue the exploration of space as one of my life's passions. Today's space-related books, movies and such still keep me inspired and informed about what's going on up there. If you need some suggestions about what to get the space cadet in your life, here on this page are some of my favorite space things. please e-mail them to us and we'll check it out.